Today was a fantastic Autumn day. The sun was shining, the 300 attendees full of joy to be together again for this very special bujinkan moment, and sensei was joyful and playful like a kid. After speaking about some writings by Takeda Shingen (http://en.wikipedia.org/wiki/Takeda_Shingen) who said that men until 20 were working to be strong and then to understand weakness, he moved on to some very interesting concepts. From this whole day of training I did my best to remember three things that he said and showed the depth of his budô. Pedro trying to explain what he felt after being used as Uke by sensei, said that he had the feeling that sensei was up and down him, inside and outside his distance, to finally realized that he (Pedro) was alone as sensei was not even there (zero state). Sensei reminded us that this particular feeling of attacking the Ten and the Chi and the ura and the Omote was the main concepts of fighting of the Gyokko Ryû. Distance being short the only way to use the body efficiently is to play with all these directions and deceive Uke on your real intentions. He added (as for everything this day) that no chikara (strength) was to be used and, as he said in our previous classes, that holding Uke without actually holding him was the key of true taijutsu. As a joke he added that being 80 years old, he had no more physical strength and that his minimalist movements done with the whole karada (body) were creating the same effect as the use of the force. Age advancing physical strength is replaced by mental strength. Once again to way to control Uke it is not about using force but on the contrary to give him the feeling that you have disappeared. At some point he spoke extensively about finding the kûkan no kyûsho (空間の急所) or the weak point of the empty space in which the fight is happening. In a movement, you should be able to understand where the Kyûsho is located, to avoid it and to throw Uke into it. He said that this was the real mastery of budô and that not so many martial artists couls even understand that. In whatever situation you encounter in life lies a kyûsho somewhere. Being able to discover this kyûsho and to use it to our own benefit is the key to happiness and safety. But the most amazing thing that sensei told us today concerned the concept of “senpen banka”. Senpen banka is another “Hatsumism” composed of three different concepts reshuffled together to create something new. “ben + ka” is in fact 変化 henka cut in two halves (hen and ka are separated)..
Senpen then is “1000 changes” and “banka” is 10000 changes. note that both hen and ka mean “change”. The concept of senpen banka is quite similar to the concept of “banpen fûgyô” (10000 changes no surprise) from the Gyokko Ryû but stronger. Sensei said that we should move in a relax manner with no preconceived ideas on what to expect or what to do, in order to be able to find the kûkan no kyûsho hidden in the situation. Also if we think a little further it can also mean that whether there are 1000 changes or 10000 changes our attitude should not be modified. Losing or winning is not the point (he reminded it to us in a recent class saying that this win/lose vision of the world was childish). By keeping the proper attitude in life one could overcome any difficulties (here the changes) that he might find on his way and lead a happy life. Once again it was for me the proof, if need to be, that the bujinkan is much more than a simple bio mechanical martial art but a real school of wisdom from which one can grow the true warrior spirit and become a true bujin. 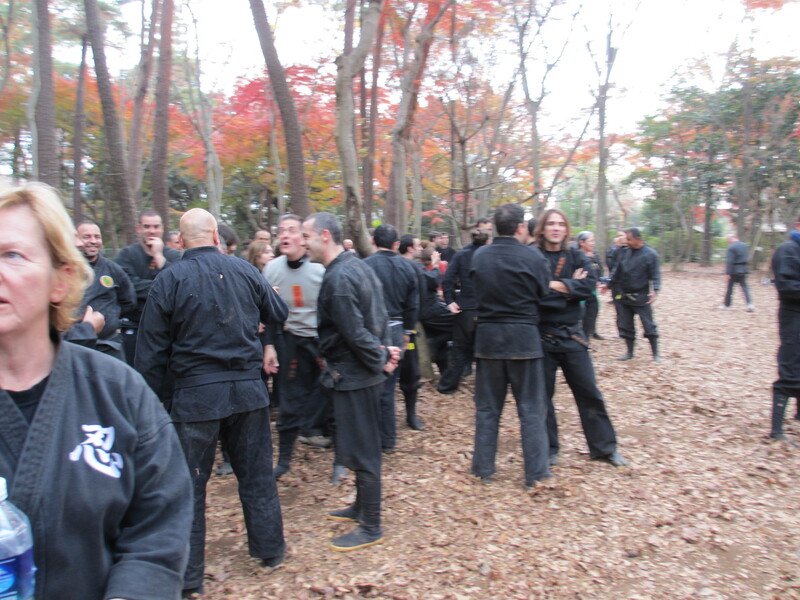 Thank you sensei for this fantastic Autumn day on the inner secrets of the kihon happô. Querido hermano. Cuanto agradezco tus informes. Me siento como si estuviese allí. Gracias por compartir tu entendimiento y confusión, pues creo que como un Ying / yang el budo personal evoluciona de esta manera: Lo que es y lo que entendemos, de ambos sale nuestro propio feeling. Solo es mi apreciación personal. Gracias de nuevo Arnaud por ayudarme a comprender un poco más el Budo de Hatsumi Sensei. Me ha encantado espeialmente eso de los “Hatsumismos…” muy apropiado. Wow! a ture insight to Soke’s ideas. Thank you so much for sharing what’s going on in the Taikai with those of us who weren’t that lucky to assist. Here i am almost two years without training, holding my child in arms and finding again wisdom from great Bujinkan shihan´s, that help me with my life. I belive that the first encounter in brazil´s Taikai in Espirito Santo was an magnificent oportunity and for that, and this lesson, i thank you again. This is an old post but I wanted to add something. The term “Senpenbanka” is NOT a term Hatsumi Sensei created on his own. At the event that Hatsumi Sensei first shared this term it was new for most people. However, having studied Hakko Ryu Jujutsu it was very clear that Hatsumi Sensei has the manuscripts for the school as he does for many ryuha. He quoted basically right from the “Shodan Higishi” training manual that describes “Senpenbanka”. I don’t think people realize just how often Hatsumi Sensei actually reads the vast library of densho and maki he has collected and then shares tid-bits in his classes. The senpenbankai is actually an old concept. You can read about it in the Shoninki. It also can be translated as “1000 forms, 10000 variations”. Also, Hatsumi sensei, in his book “The Way of the Ninja”, says that “[…] in ancient Japan, ‘ten thousand’ was synonym of ‘infinite’ […]”.